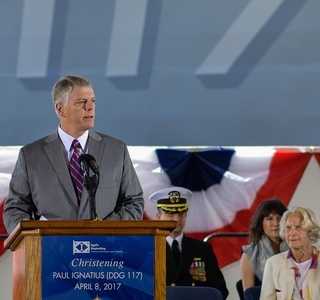 PASCAGOULA, Miss., April 08, 2017 (GLOBE NEWSWIRE) -- Huntington Ingalls Industries’ (NYSE:HII) Ingalls Shipbuilding division christened its 31st Arleigh Burke-class guided missile destroyer, Paul Ignatius (DDG 117), with approximately 1,000 guests in attendance at today’s ceremony. DDG 117 is named in honor of Paul Ignatius, who served as the United States’ 59th Secretary of the Navy from 1967 to 1969. He made significant contributions during the administrations of presidents John F. Kennedy and Lyndon B. Johnson. Ignatius is a living namesake and was in attendance for today’s ceremony. 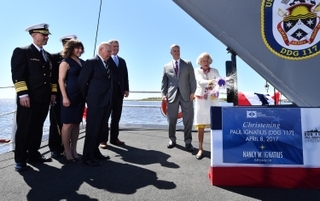 Nancy W. Ignatius, his wife, is the ship’s sponsor and officially christened the ship after successfully breaking a bottle of sparkling wine across its bow. Paul and Nancy Ignatius have been married nearly 70 years and have four children together. 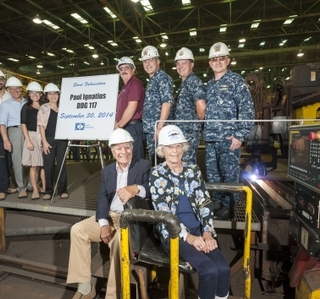 They were escorted to the platform by Ingalls Shipbuilding President Brian Cuccias. Ingalls has delivered 29 Arleigh Burke-class destroyers to the U.S. Navy. 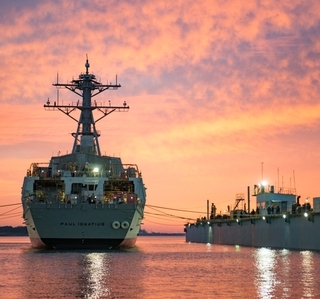 Other destroyers currently under construction at Ingalls include Ralph Johnson (DDG 114), Delbert D. Black (DDG 119), Frank E. Petersen Jr. (DDG 121) and Lenah H. Sutcliffe Higbee (DDG 123). Arleigh Burke-class destroyers are highly capable, multi-mission ships that can conduct a variety of operations, from peacetime presence and crisis management to sea control and power projection, all in support of the United States’ military strategy. DDGs are capable of simultaneously fighting air, surface and subsurface battles. The ship contains myriad offensive and defensive weapons designed to support maritime defense needs well into the 21st century.